This is the first cabin Benson built shortly after arriving on the property in February 1989. Benson attended Dunwoody Institute in Minneapolis where he briefly studied architectural drafting. 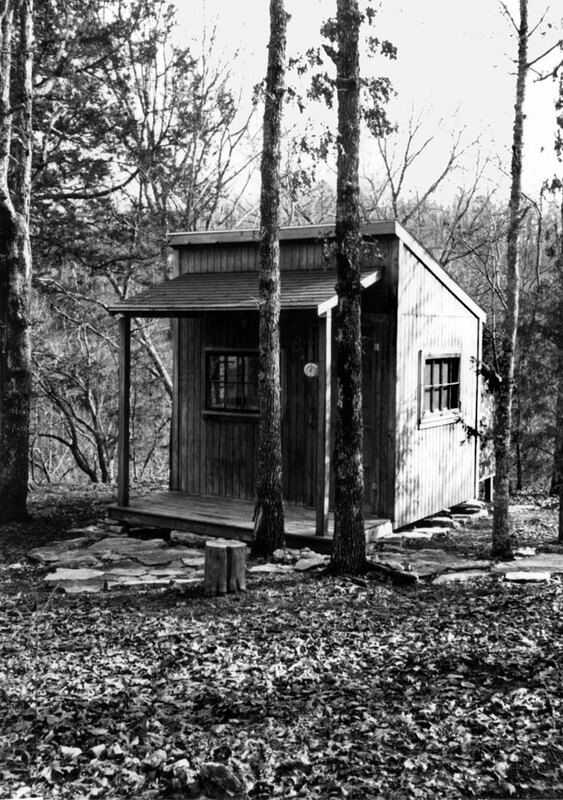 Before leaving for the Ozarks, he drew the blue prints for this small cabin that measures 8x10 feet (2.438 x 3.048 meters). Like cabin No.2, this cabin also used salvaged doors and windows and the walls were designed to accommodate their various sizes and shapes. The cabins foundation consists of dry-stacked stones placed under each corner of the house. The cabin took about 10 days to build. 1989, scanned black & white print, 3 x 5 in. (7.62 x 12.7 cm). Ozark Series. © 2008 by Allen C. Benson.